The Mano Marine 23.10 WA is a great choice for daily trips or more days cruise. It is equipped with inboard Mercruiser 4.3 MPI engine with Bravo Three propulsion. This combination enables Boat to cruise at 26 knots with top speed of 35 knots. For easy docking boat you can use powerful bow thruster. For this boat you need to have boating licence or you have to hire skipper (skipper available from 50€). Boat is equipped with everything for your safety and easy navigation: life jackets, first aid kit, fire extinguisher, GPS, depth sounder, radio, Info map, Nautical map, basic engine tools, fire extinguisher, navigation lights etc. Cabin has two central berths, toilette, and auxiliary berth (low ceiling berth). On the outside, Boat features large front sundeck, as well as smaller aft sundeck and bathing platform with ladders. Cockpit is in shade thanks to large bimini awning (removable). Under the cockpit seat you will find sink and gas cooker. Our base harbour is Luka Opatija, in Opatija center. From here you need half hour navigation to reach nearby islands Cres or Krk with many beautiful beaches and bays. Towns Cres and Krk are just an hour away and are ideal place for lunch break and nice sightseeing. We can help you with choosing your route depending on weather, your preferences and experience. 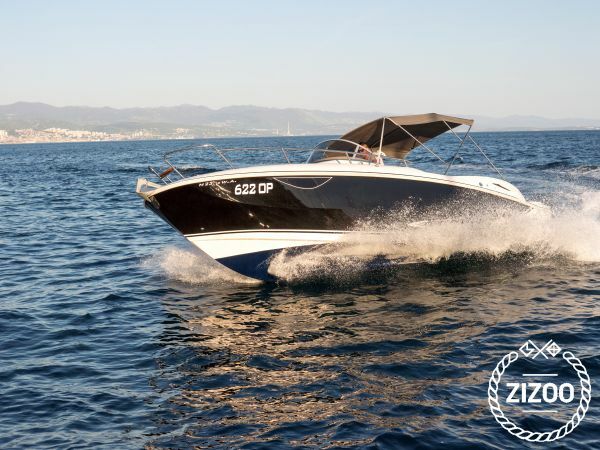 Book this boat, and we will make sure you discover the best of Northern Adriatic.